Positive earnings and positive Fed comments produced a huge gain. The recent earnings trend of lowered guidance was tempered somewhat on Wednesday and sentiment quickly improved. The Fed promised to be patient in its rate hikes and agreed to reduce its balance sheet program if necessary. The market celebrated and stocks surged. Advancers were 3:1 over decliners. No specific news. Shares posted a strong $4 gain to close just barely over resistance at $150. Raymond James initiated coverage with a buy rating and $57 price target. Dell Technologies Inc. designs, develops, manufactures, markets, sells, and supports information technology (IT) products and services worldwide. It operates through three segments: Infrastructure Solutions Group (ISG), Client Solutions Group (CSG), and VMware. The ISG segment provides traditional and next-generation storage solutions; and rack, blade, tower, and hyperscale servers. It also offers networking products and services that help its business customers to transform and modernize their infrastructure, mobilize and enrich end-user experiences, and accelerate business applications and processes; and attached software, and peripherals, as well as support and deployment, configuration, and extended warranty services. The CSG segment offers desktops, notebooks, and workstations; displays and projectors; third-party software and peripherals; and support and deployment, configuration, and extended warranty services. The VMware segment offers compute, management, cloud, and networking, as well as security storage, mobility, and other end-user computing infrastructure software to businesses that provides a flexible digital foundation for the applications that empower businesses to serve their customers globally. The company also offers cloud-native platform that makes software development and IT operations a strategic advantage for customers; information security and cybersecurity solutions; cloud software and infrastructure-as-a-service solutions that enable customers to migrate, run, and manage mission-critical applications in cloud-based IT environments; cloud-based integration services; and financial services. The company was formerly known as Denali Holding Inc. and changed its name to Dell Technologies Inc. in August 2016. Dell Technologies Inc. was founded in 1984 and is headquartered in Round Rock, Texas. Company description from FinViz.com. Dell was taken private several years ago and disappeared from the market. When they acquired VMWare they had a tracking stock representing their 80% interest in the company under the symbol DVMT. In December they bought back that tracking stock in a complex transaction and then changed the ticker to DELL. Today, this represents all of Dell. 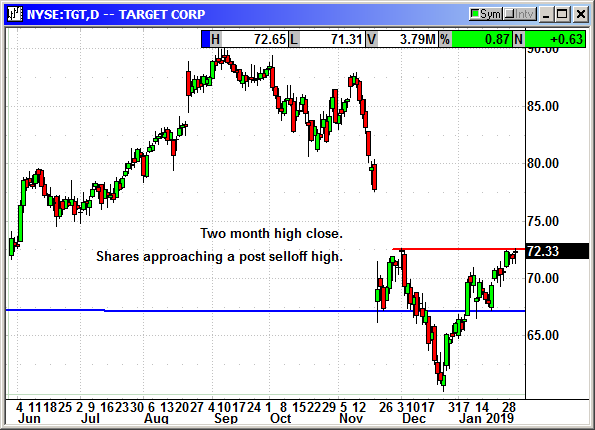 Over the last month Citigroup and Goldman initiated coverage with a buy rating and average target price of $60. 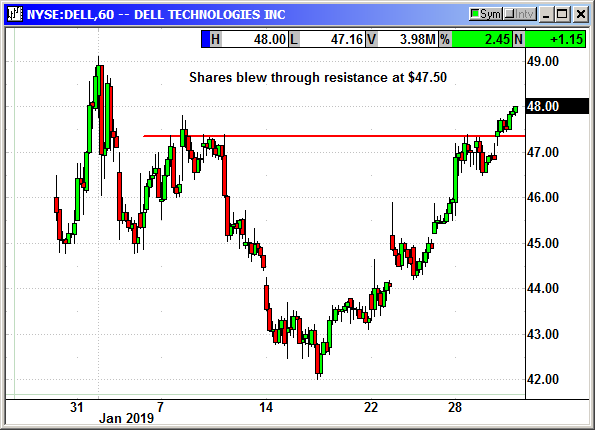 Now that Dell is back as an operating company with strong management, we should be seeing a lot of funds and institutional investors moving back into the stock. Dell has 145,000 employees. It is not a small company and it is a leader in the PC/Server sector and of course VMWare is a major component of the cloud. Since the new Dell shares have only been around a month, they are definitely not over-owned. Long April $47.50 call @ $2.60, see portfolio graphic for stop loss. No specific news. 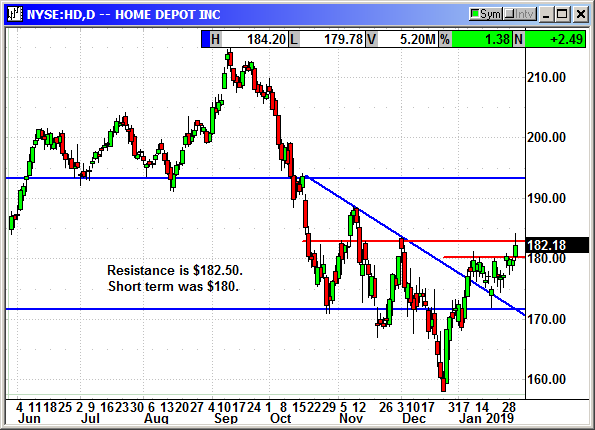 Shares rallied with the Dow to close over short-term resistance at $180. No specific news. Short term support held, and we could try a breakout next week. The index is up strongly from December and it has held its gains. The investment seeks to track the investment results of the NASDAQ Biotechnology Index, which contains securities of companies listed on NASDAQ that are classified according to the Industry Classification Benchmark as either biotechnology or pharmaceuticals and that also meet other eligibility criteria determined by Nasdaq, Inc. The fund generally invests at least 90% of its assets in securities of the index and in depositary receipts representing securities of the index. It may invest the remainder of its assets in certain futures, options and swap contracts, cash and cash equivalents. It is non-diversified. Company description from FinViz.com. 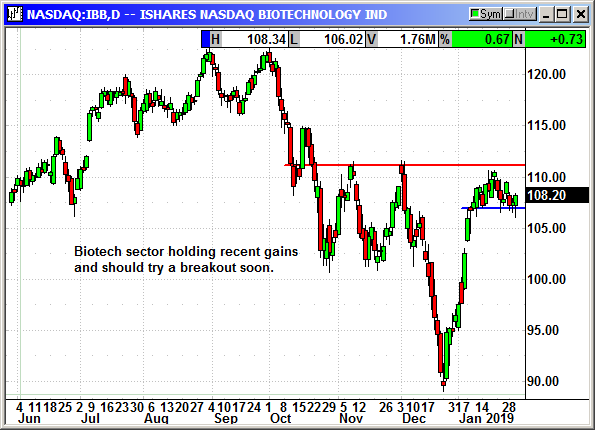 The IBB has 226 stocks and follows the Nasdaq Biotech Index ($NBI). 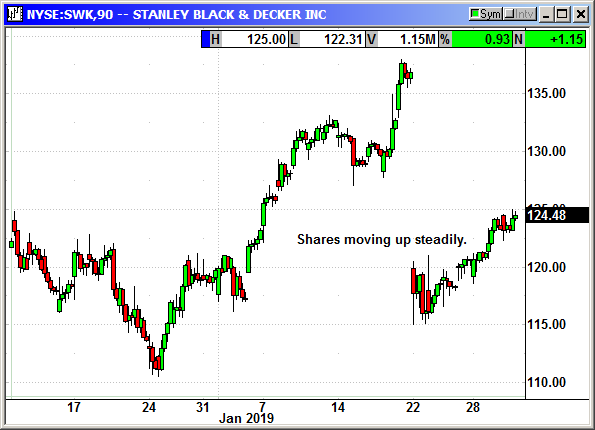 The IBB rebounded strongly from the Christmas bottom and then stalled for over a week in the $108 range as it consolidated its gains. 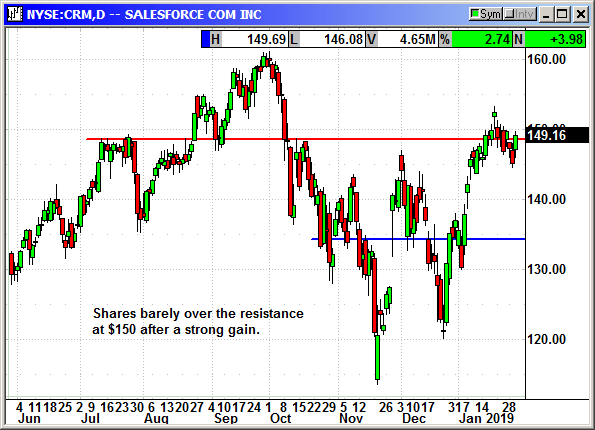 Friday's minor gain set it up to test resistance at $111.50 and a breakout there would target the prior highs at $122. The first quarter is normally strong for biotechs because of the multiple conferences and calendar of FDA drug approvals. 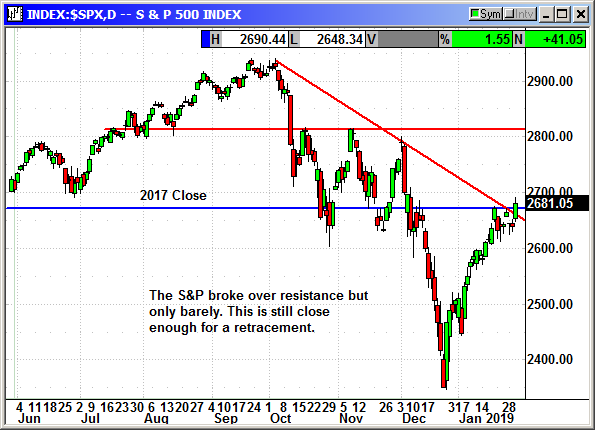 I am recommending we enter a position to benefit from a break over resistance. Long March $115 Call @ $1.79, see portfolio graphic for stop loss. No specific news. No reason to close the position for 5 cents. The original play description was to buy "an inexpensive February call and hold over earnings." Those will be out on Feb 1st. The call cost 85 cents. 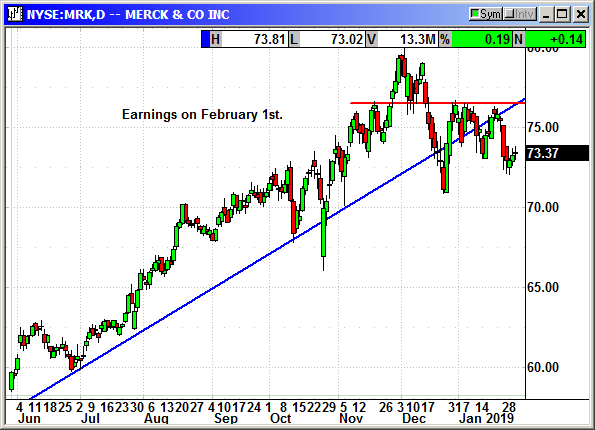 Merck has earnings on February 1st. I am recommending we buy a cheap February call and hold over the earnings report. Excellent rebound with a $4 gain. Long March $170 Call @ $1.77, see portfolio graphic for stop loss. Expired 1/18: Adjusted cost for 6 = $.29 each. Expired, -.29 loss. New 6-week high close. 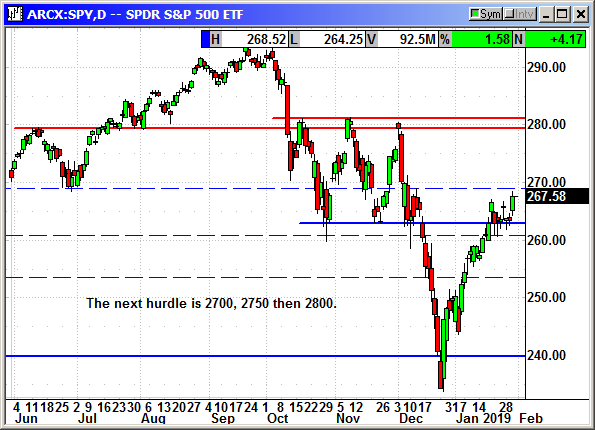 The next hurdle is 2,700. OpenGate Capital has agreed to buy lock maker Sargent and Greenleaf from SWK. The lock maker was founded in 1857 and sells products in more than 100 countries. No terms were disclosed and the transaction will be completed in March. Long Mar $125 Call @ $2.40, see portfolio graphic for stop loss. No specific news. Holding right at a 2-month high. Long March $72.50 call @ $2.08, see portfolio graphic for stop loss. 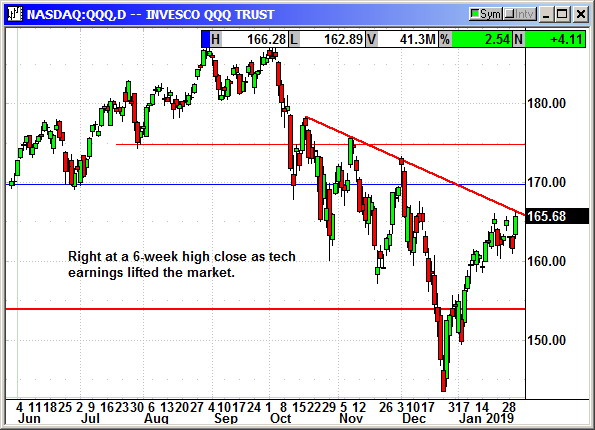 QCOM reported earnings after the close and should their afterhours gains hold, we will be stopped out at the open on Thursday. The company reported earnings of $1.20 that beat estimates for $1.09. Revenue of $4.84 billion missed estimates for $4.90 billion because of Apple's continued refusal to pay their royalties and license fees. They guided for Q1 earnings of 65-75 cents and revenue of $4.4-$5.2 billion. Analysts were expecting 69 cents and $4.83 billion. Shares rose to $51.40 in afterhours. They did not mention the current FTC case in their earnings release. They did mention the billions owed by Apple and Huawei that will be paid if the various court cases end in Qualcomm's favor. Update 1/5: Qualcomm acted to enforce the ban on iPhones in Germany and Apple was forced to pull the specific models from stores. Germany's biggest retailer, Gravis, said it still had all Apple products on sale but that is likely to end quickly. Qualcomm posted a bond of 1.34 billion euros in order to put the enforcement into effect. According to the court order, Apple had to stop the sale, offer for sale and importation for sale of all infringing iPhones in Germany. The court also ordered Apple to recall the affected iPhones from third-party resellers in Germany. The 10-day non-jury trial with the FTC over patent procedures began on Friday. 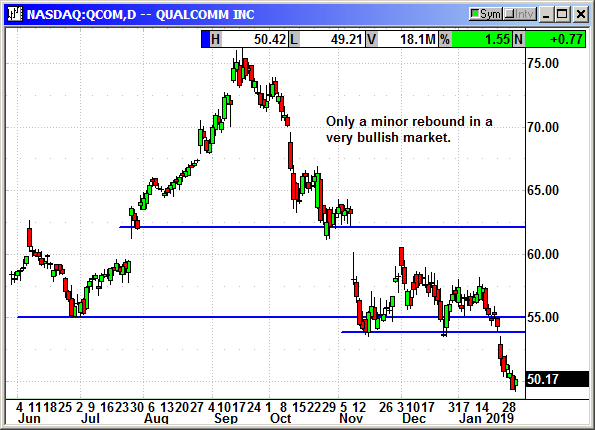 Update 1/23/19: Noted short seller Sahm Adrangi and his Kerrisdale Capital hedge fund took aim at Qualcomm saying a loss to the FTC in the current trial would cut the stock price in half. If the company loses they would be forced to "license core patents to competitors and to renegotiate all of its existing licenses on fair terms." Kerrisdale argued that Judge Lucy Koh, currently presiding over the case, has already ruled against the company on several maters and may be inclined to rule in favor of the FTC. 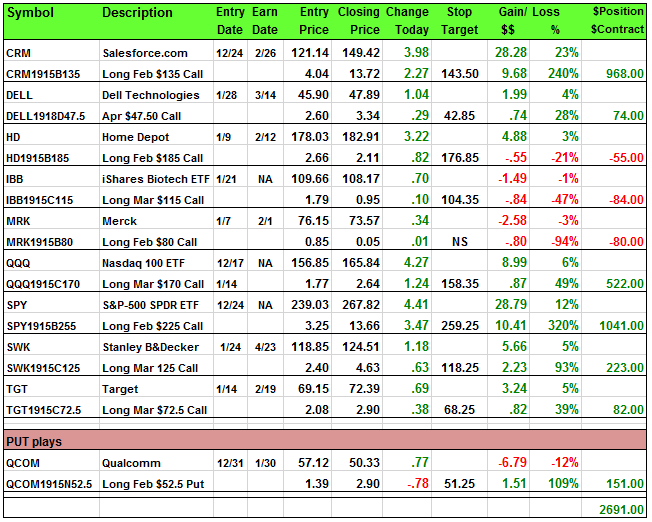 Previously closed: 1/22: Long Mar $60 Call @ $2.06, exit .60, -1.46 loss.